.. a little CBS summer experiment premiered. Was supposed to be 8 shows and done. It ended up to be 110 episodes; 1990-1995. Wow..
After visiting Moosefest in the summer of 2015, I can tell you Northern Exposure fans are still the most gracious and wonderful honorary Cicelians I have even known. We had a book signing event and the line went around the block of Dr. Fleischman's office (now Cicely Gifts). It was July of 1990 that our pilot episode aired on CBS and I know my life hasn't been the same since. Many of those same fans are helping our effort to reboot the show (details here). In May of 2013 we invited everyone to participate in the creation of my book, Northern Exposed with an Indiegogo crowdfunding campaign. The response was, in a word, stunning. Led by former location manager Vickie Berglund-Davenport, we took a camera to Roslyn and revisited all the iconic locations from the show, and then I sat down with all the surviving cast members (Peg left us too soon and we dedicated the DVD set to her memory) and we talked about our memories. 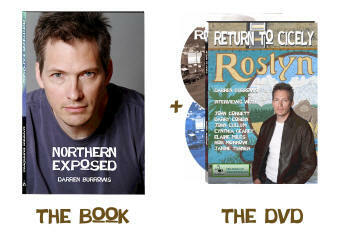 The result of all this was a book and DVD set that thousands of good folks really seem to enjoy! 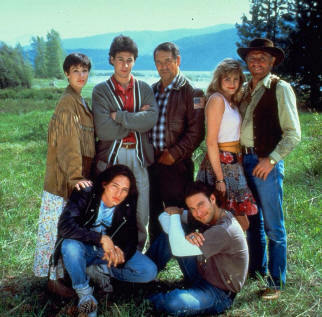 Northern Exposure was an extraordinarily peculiar network television show and no one had any expectations for it. Tossed into the CBS lineup in the middle of the summer of 1990, it was expected to fill eight hours of primetime television programming and then go its merry way into oblivion. What CBS didn't count on was an addictive combination of quirkiness and adventure that would rivet millions of fans, creating a cult-like following that would drive them back to the box to watch their Northern Exposure friends on a regular basis. My character, Ed Chigliak (whose last name I didn't learn until the sixth episode) was perhaps the most peculiar of them all. Ed bridged the world of the wilderness with that of modern America. He was wise in the ways of his native forefathers and could effortlessly quote Woody Allen and Steven Spielberg. Northern Exposed gives those millions of Northern Exposure fans the opportunity to enjoy an inside look at the interaction and daily lives of that cast and those producers. Because the book and DVD complement each other, we are only offering them together at one great price. Enjoy! This 228-page book is filled with insights into the filming of all your favorite episodes of Northern Exposure. Memories of the cast and the crew and theories about what did happen to ultimately get the show cancelled. The DVDs (there are 2) take you to the locations for all the key episodes to see what they look like today. The surviving cast members give their thoughts on those days and what made the show great. DVD extras include the building of the Trebuchet and Dr. Fleischman's house, plus a backstage tour of the studio in the final days of the show's production. This 228-page FIRST EDITION Hardcover book is filled with insights into the filming of all your favorite episodes of Northern Exposure. Personally autographed by Darren Burrows, it is also serial-numbered. Only 500 of these first editions will be marketed, and some have already been sold during our Indiegogo Campaign. The DVDs (there are 2) take you to the locations for all the key episodes to see what they look like today. The surviving cast members give their thoughts on those days and what made the show great. DVD extras include the building of the Trebuchet and Dr. Fleischman's house, plus a backstage tour of the studio and the sets in the final days of the show's production. $50.00 Gets you both items! $125.00 Gets you both items!